SFC, the leading manufacturer of mobile fuel cells, presents latest fuel cell technology with EFOY, now, the advantages of the popular SFC A50 fuel cell, have been pushed even further with the new EFOY product family. All the power you need, whenever and wherever you need it, no matter what the season or the weather. All extremely reliable, quiet and maintenance free! 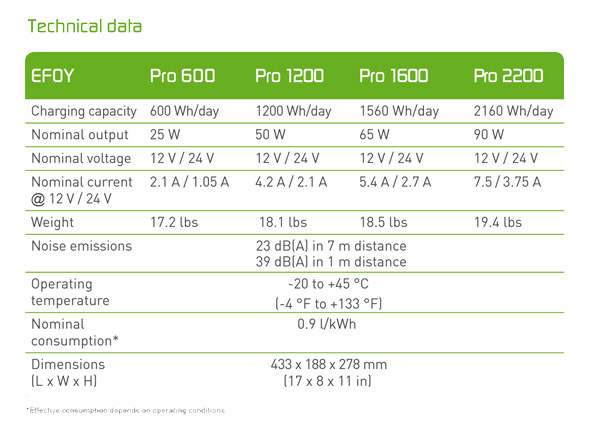 EFOY is available in four levels of performance: 600, 1200, 1560 and 2160 Wh/day versions, EFOY fuel cells provide the right amount of power for every requirement. The SFC fuel cell provides 12-volt batteries with up to 380 Ah daily as needed. Alone, or in combination with a photo-voltaic system, the EFOY can run on its own for months on end. Integration into an existing system goes without a hitch. Equipped with up to 30 liters of methanol, the EFOY can generate more than 2000 Ah of energy, enough for several months during the coldest time of the year. Costly service calls to replace batteries are a thing of the past. The EFOY automatically notes power consumption and recharges batteries as needed. The fuel cell also recognizes power flows from a solar system and automatically switches to standby, thus avoiding costly service calls. The EFOY data-collection software and remote control feature afford the convenience of remote monitoring, giving you complete control of the system, anytime, anywhere. The EFOY is suitable for a wide range of applications and temperatures ranging from -20°C to +40°C. A heating mode prevents the fuel cell from freezing as it warms the interior completely automatically, protecting battery, gauges and accessories against frost. The heating mode consumes so little methanol that an M10 fuel cartridge is sufficient for almost a year. Temperatures down to -35°C are possible for special applications. The EFOY Pro Series has been designed especially to meet the exacting demands of professional and government customers. The EFOY Pro Series fuel cells come in four models: the EFOY Pro 600, EFOY Pro 1200, EFOY Pro 1600 and EFOY 2200, featuring charging capacity from 600 to 2160 watt hours per day. If more power is needed, just combine several EFOY Pro fuel cells.